If you don't have a spare VGA, DVI, or HDMI port, you can still use USB. You can work far more efficiently with two—or better yet—three monitors than with one. But your hardware may not support that many. if you have a desktop PC, you can update the video card, but that’s not an option with a laptop. Even with a desktop, there are easier solutions than installing a new video card—especially if you’re not enthusiastic about opening your PC. StarTech.com manufactures and sells a wide selection of USB-to-video adapters for various configurations. For instance, it offers adapters for VGA, DisplayLink, DVI, and HDMI. Some require USB 3.0—a good choice for gaming, graphic design, or HD video. Some of the USB 3.0 adapters even have USB 3.0 pass-through, so you won’t have to lose the use of that port for other devices. I tested the most generic of Startech's adapters, the USB to VGA External Video Card Multi Monitor Adapter – 1920x1200 (model number USB2VGAE3). As the name suggests, it connects to a USB 2.0 port and to your monitor’s VGA port, and can handle resolutions up to 1920x1200. It lists for $76; I didn’t find significant discounts at other online sources. A piece of tape on the USB plug warns you to install the drivers first—you can’t plug it in without at least reading that warning. I recommend you skip the enclosed CD and download drivers from StarTech.com’s website. The documentation lists the USB2VGAE3 as compatible for Windows 2000 - Windows 7. I tried it on Windows 8 with no problems. After I installed the drivers, rebooted, and plugged in the adapter, it just worked. 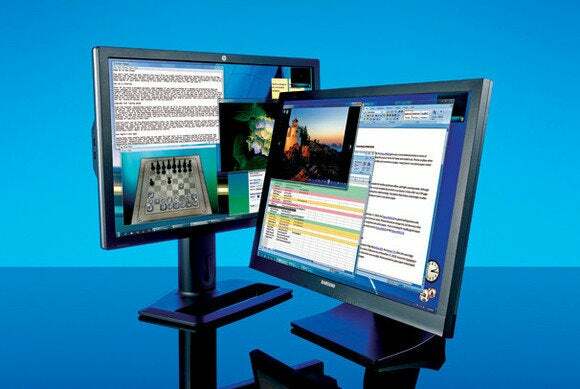 However, you can’t use Windows’ own tools to set up how the monitors will work together. For that, you’ll find a new, purple monitor icon in the notification area. Click that for options.